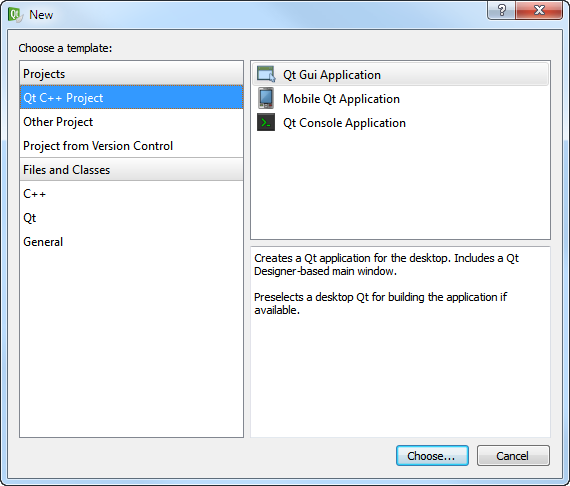 Note: This tutorial assumes that you have experience in writing basic Qt applications, using Qt Designer to design user interfaces and using the Qt Resource System. 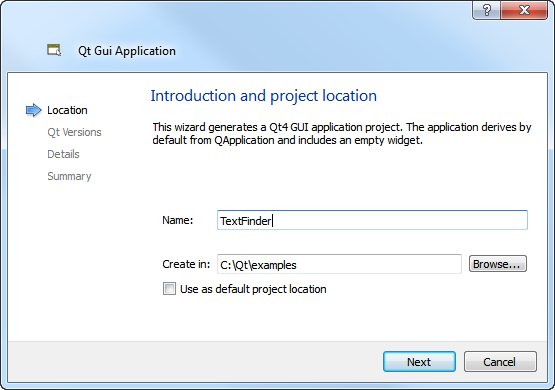 This tutorial describes how to use Qt Creator to create a small Qt application, Text Finder. It is a simplified version of the QtUiTools Text Finder example. 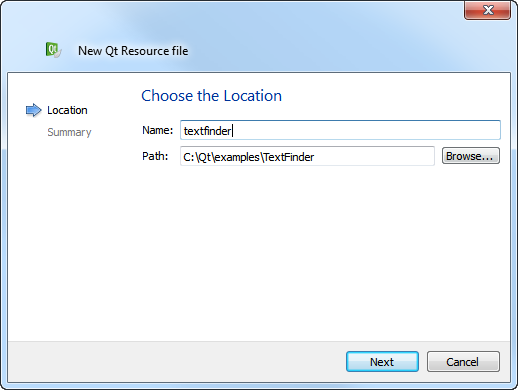 Qt Creator automatically detects whether the location of Qt is in your PATH variable. 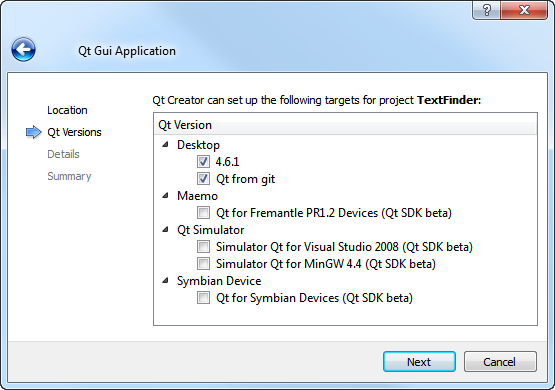 If you have installed several Qt versions, follow the instructions in Selecting the Qt version to set the Qt path. 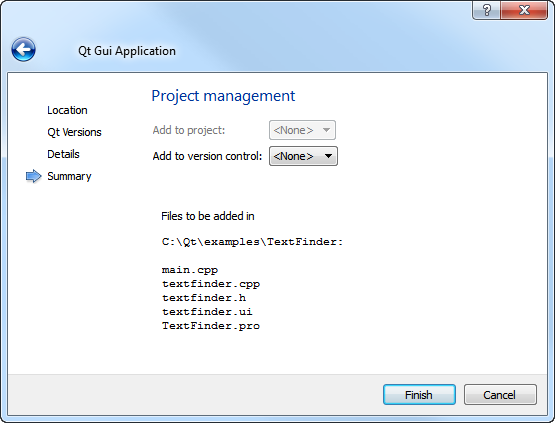 Select File > New File or Project > Qt Application Project > Qt Gui Application > Choose. In the Name field, type TextFinder. Click Next to use the Qt version set in the path in your project. In the Class Name field, type TextFinder as the class name. 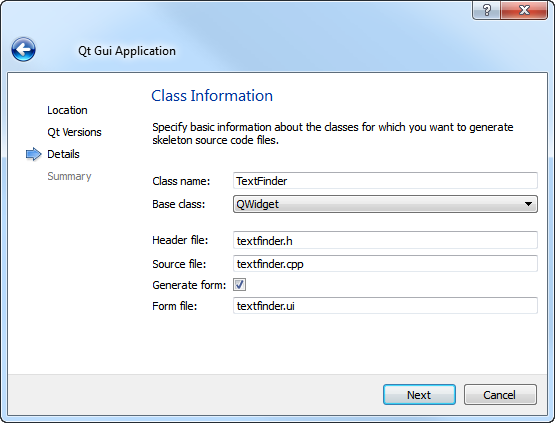 In the Base Class list, select QWidget as the base class type. The .h and .cpp files come with the necessary boiler plate code. The .pro file is complete. Begin by designing the user interface and then move on to filling in the missing code. Finally, add the find functionality. 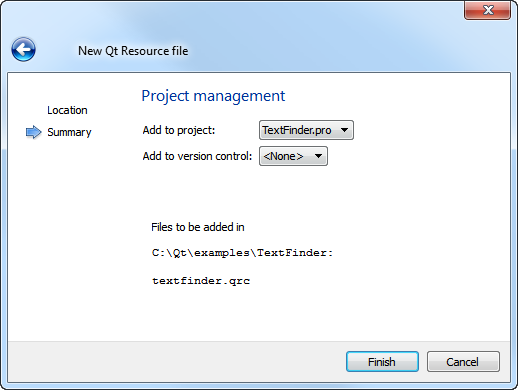 In the Editor mode, double-click the textfinder.ui file in the Projects view to launch the integrated Qt Designer. Double-click the Label widget and enter the text Keyword. Double-click the Push Button widget and enter the text Find. In the Properties pane, change the objectName to findButton. Press Ctrl+A to select the widgets and click Lay out Horizontally (or press Ctrl+H) to apply a horizontal layout (QHBoxLayout). Drag and drop a Text Edit widget (QTextEdit) to the form. Select the screen area and click Lay out Vertically (or press Ctr+V) to apply a vertical layout (QVBoxLayout). Applying the horizontal and vertical layouts ensures that the application UI scales to different screen sizes. 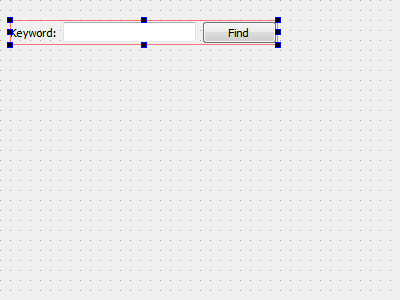 Right-click the Find button to open a context-menu. Select Go to Slot > clicked(), and then select OK.
A private slot, on_findButton_clicked(), is added to the header file, textfinder.h and a private function, TextFinder::on_findButton_clicked(), is added to the source file, textfinder.cpp. For more information about designing forms with Qt Designer, see the Qt Designer Manual. 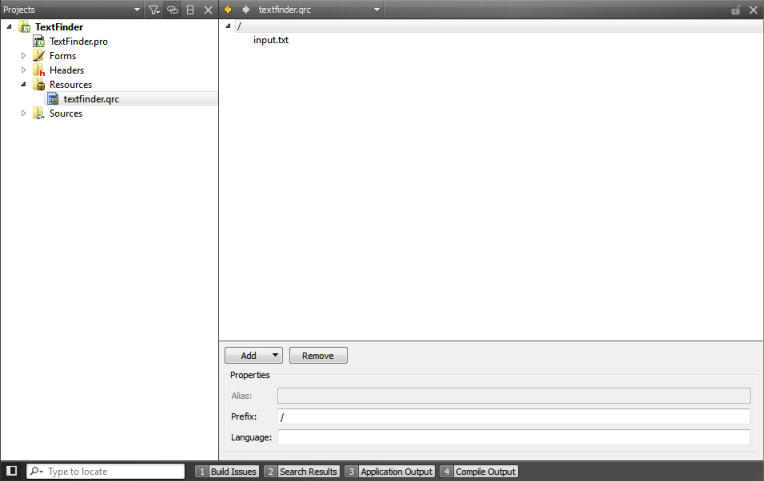 The textfinder.h file already has the necessary #includes, a constructor, a destructor, and the Ui object. You need to add a private function, loadTextFile(), to read and display the contents of the input text file in the QTextEdit. In the Projects view, double-click the textfinder.h file to open it for editing. 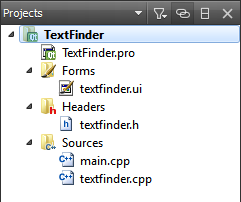 Now that the header file is complete, move on to the source file, textfinder.cpp. 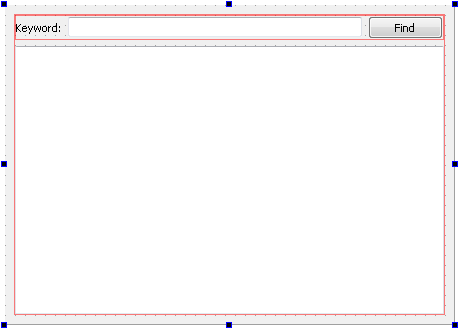 In the Projects view, double-click the textfinder.cpp file to open it for editing. 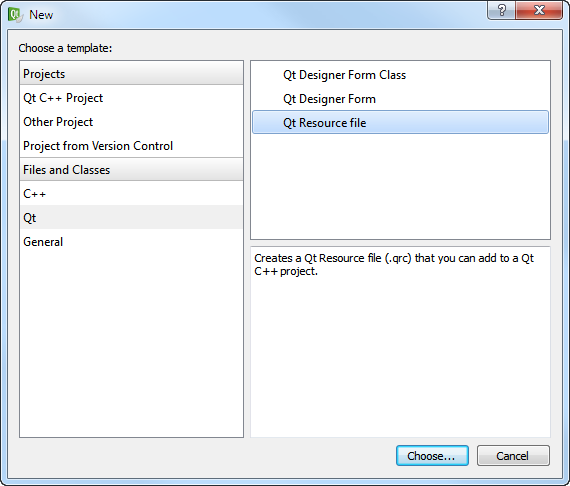 You need a resource file (.qrc) within which you embed the input text file. The input file can be any .txt file with a paragraph of text. Create a text file called input.txt and store it in the textfinder folder. Select File > New File or Project > Qt > Qt Resource File > Choose. The Choose the Location dialog opens. In the Name field, enter textfinder. In the Path field, enter C:\Qt\examples\TextFinder, and click Next. 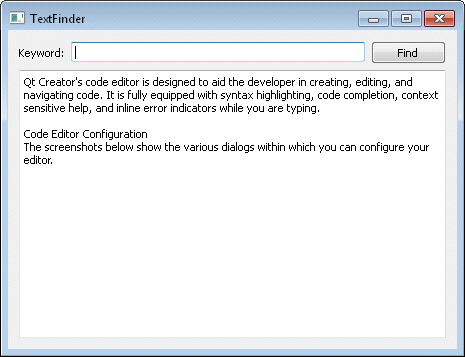 In the Add to project field, select TextFinder.pro and click Finish to open the file in the code editor. Select Add > Add Prefix. In the Prefix field, replace the default prefix with a slash (/). Select Add > Add Files, to locate and add input.txt.